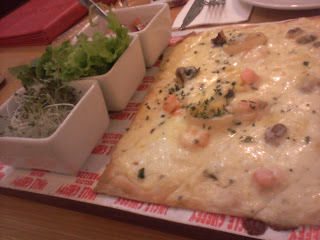 I love the not-so-thin but just-right-thin crust of Uncle Cheffy's Salmon Pizza. Also, it has a generous amount of cheese and served with salad- alfalfa sprouts and tomatoes. Regular size costs P220. Not bad! The pizza can be rolled also- think "Dear Darla" of Yellowcab. I can't remember the name of the past but it tastes good!